by Donald Chauke. I’ve come to realise how valuable being part of a startup business was for me, as an intern. I may have been a client service intern but, because I was in a startup environment, my duties were diverse and dynamic. On the first day of my internship, I was filled with mixed emotions, anxiety and excitement being the most noticeable. This was my first and all I was looking for was experience and knowledge. It’s not every day that an intern will have the opportunity to gain first-hand experience and work closely with clients but I was fortunate enough to walk into a world of opportunity. You will learn a lot about how companies work. By nature, startups entail a small-team setting and this means that you will be around every part of the business. I sat in every client meeting/presentation, design reviews, brainstorm sessions, status meetings and every other meeting I could attend and this ensured that I clearly understood how the different departments linked up. I imagine that, as an intern for a big established company, your exposure will be limited to the department that you are directly working in and it’s nearly impossible to effectively expose yourself to all aspects of the business. So, whether it’s listening in during a design review or a brainstorm session, you’re always in the loop at a startup. Your work will be seen and assessed; startup interns are considered a critical part of the team and your performance is always visible and your efforts count, as opposed to large companies where your work may get lost. My managing director was willing to spend one-on-one time with me for a weekly update on my performance. This did wonders for my confidence, productivity and skills. Because my work was seen and evaluated on a weekly basis, it was very easy for me to see when and where I had failed. This ensured that I was conscious and aware of my tasks, which helped to eliminate mistakes. A lot of the time, boring and arbitrary work gets dumped on the intern; this is very unlikely in a startup as no work is regarded as unnecessary. Even if you do get boring work, ask for guidance and support and do the work very well. This will make you stand out like a full-time employee who is expected to have an impact. Experienced individuals surround you; I was learning from and working closely with the design director and the MD and this, to me, was in itself a big deal. The creative director was the kind of a person who stepped in every morning with profound enthusiasm and every job out of his studio had to have high design standards. The MD upheld a culture of excellence and professionalism; she is the kind of person who is pedantic about grammatical errors and misspelled words in any communication, among other important disciplines. This type of environment enabled me to bring out the best in myself. Startup businesses will always be looking to attract and retain talent, so living up to the set standards is a step in the right direction. There is unlimited learning; how much you want to learn and the amount of experience you can gather is entirely up to you. One day I found myself working on an advertising campaign and the very next day working on a brand identity project. With multiple projects running in tandem, you will be learning to thrive under pressure and take on whatever comes your way. When I started my internship, there was no computer to spare so, for the first two weeks, I sat at my desk reading advertising books, brand manuals, client services books and any other relevant ones I could get my hands on. The information overload was unbearable but that’s what I was there to do: to absorb as much information as I could. Have patience; the one quality that will benefit you in every aspect of your life is patience. For me, patience portrays high moral standards, especially in today’s world where things come really fast. It’s also important to keep in mind that, as an intern, nothing will ever run on your schedule so, if an opportunity to learn or experience something new presents itself at 8pm in the evening, be sure to be there. Be patient, be tenacious and never be afraid to put in a hard day of work. Donald Chauke met Fiona Hitchcock when he was working for a retailer. A conversation resulted in his starting with Hitchcock & Associates (which became Hitchcock Michalski), in 2014. 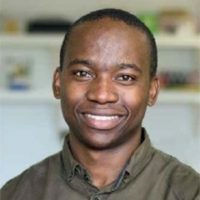 He has rapidly proven himself in every area of the business and his hard work, willingness and dedication have resulted in him becoming a shareholder of Hitchcock Michalski Africa, a Level 2 BBBEE branding and design company part of the Hitchcock Michalski Group.